Reboot's first Hanukkah Pop-Up, which will debut at Partners in Crime on Union Street in San Francisco from Dec. 15 to 18, 2016. There are pop-up cinemas, cafes and restaurants. 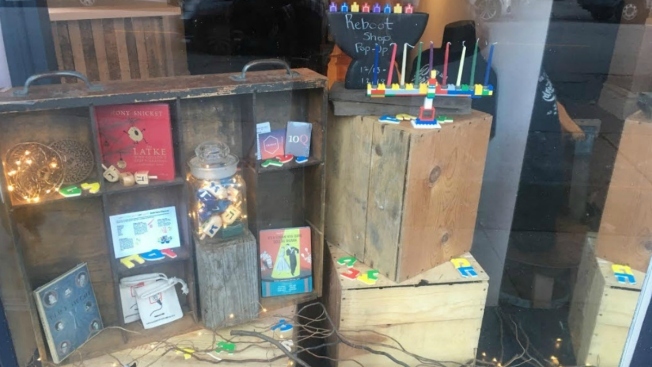 Now, there’s the first “Reboot Shop Hanukkah Pop-Up” on Union Street in San Francisco. So, what does that mean for the average passerby during the holiday season? Well, there is dreidel gaming night with Mazel Tov cocktails (yes, those! ), a reading by author Daniel Handler - best known under his pen name Lemony Snicket, and his wife, and illustrator and author Lisa Brown. There will also be a film screening of 50/50 created by award-winning filmmaker Tiffany Shlain, and a lunchtime concert co-presented by Noise Pop with Luther Dickinson, former lead guitarist for The Black Crowes, Jeremiah Lockwood of The Sway Machinery and Ethan Miller of Howlin' Rain. Plus, the pop-up will sell all sorts of trinkets including a cell phone sleeping bag, and ‘Twas the Night Before Hanukkah CD box set, a DIY ugly Hanukkah sweater and more. The pop-up will be up from Dec. 15 to Dec. 18 from 10 a.m. to 7 p.m. at Partners In Crime, 1749 Union Street. Hanukkah this year begins on Christmas Eve and lasts through sundown on New Year's Day. Reboot is a nonprofit that creates new ways for Jews to create traditions of their own. For more information on exact times and dates click here.